It's reveal day, y'all! Some pretty awesome local clients of mine recently finished up their new master bedroom, and now that it's done, they were kind enough to let me share it with you! Since I focus on e-design, and my clients are so often not local, it's a joy when I get the chance to actually visit someone's home in person and see how my design for their space came together in real life. I can't say enough great things about these clients. 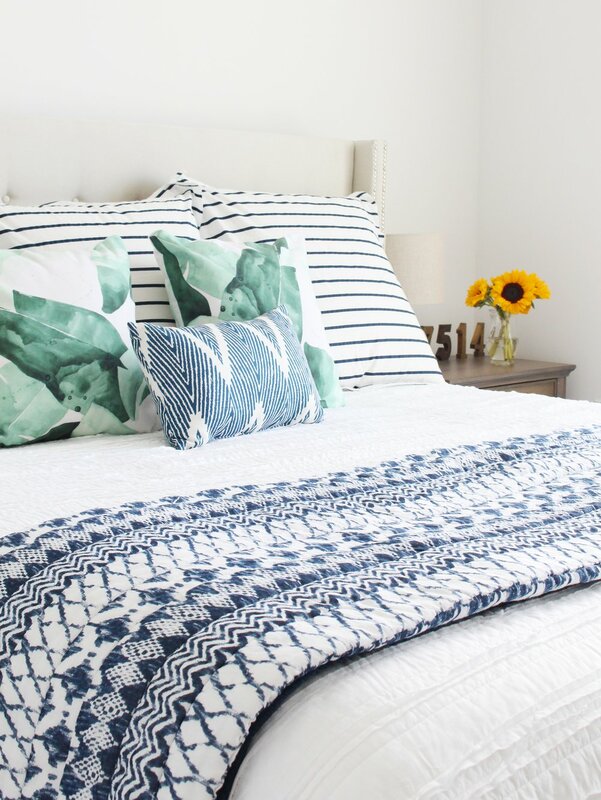 Working with them to make their master bedroom a stylish sanctuary was so fun! They're a family of five who moved to Philadelphia several years ago from New York City, and are busy working and raising three incredible kiddos, so designing a bedroom was pretty low on their priority list. In addition to his full time job, the husband, JT, also writes a pretty fantastic personal finance blog called Just Making Cents. Go check it out, read some of his words of wisdom, and say hello! 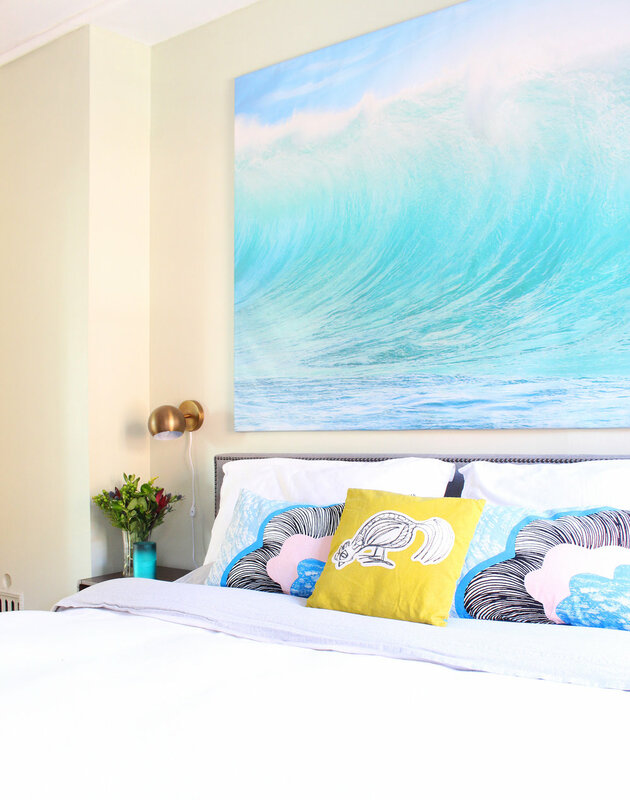 When my clients decided it was finally time to give their bedroom a makeover toward the end of last year, they enlisted Mix & Match's services to help. They have an incredible sense of style and knew the general direction that they wanted their bedroom to go, but they found they didn't enjoy the actual design process and wanted guidance (and accountability) to make sure it would turn out the way they envisioned. E-design was just the right amount of hand-holding they needed to finally #getitdone. 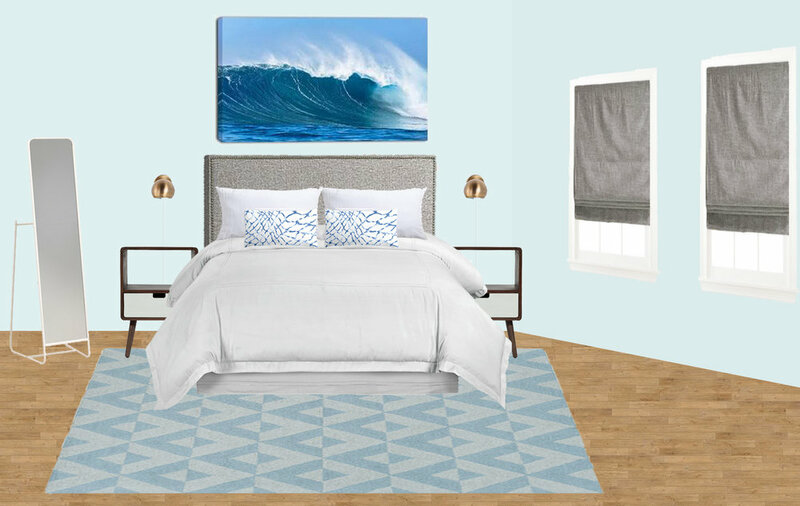 These clients love mid-century and modern pieces, but they've also got a little bit of a California cool vibe going on (he grew up there, so it makes sense! ), so we wanted to incorporate that in as well. 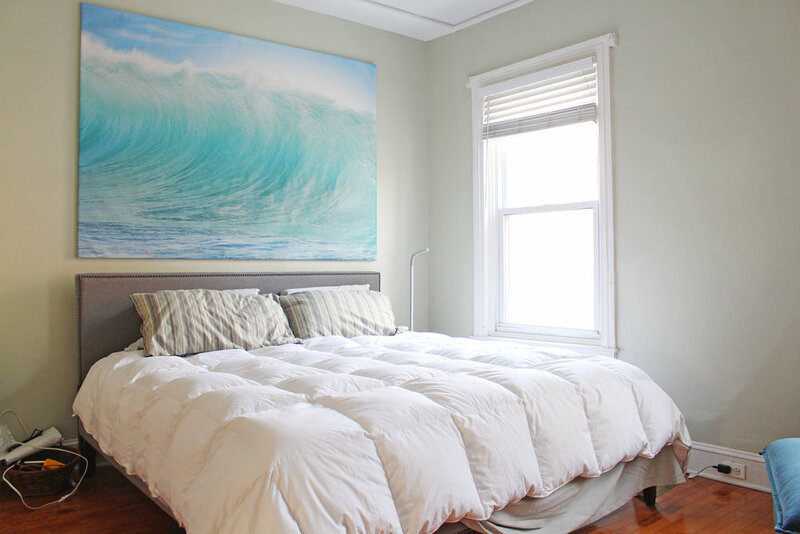 The pieces they requested to keep were their upholstered bed from West Elm* and the oversized wave canvas above the bed. I was definitely on board with that! They also had a desire to add an open closet system since their older Philadelphia row house didn't have any closets and they were storing most of their clothes in other rooms. I loved that idea - just wait until you see how it turned out; it'll make you want to put one in your own bedroom! So let's get to the good stuff - the before and after! Here's the final design plan we came up with for the side of the room with the bed. The open closet system would be installed on the wall opposite the bed where the dresser is in the photo above. Once my clients had the design plan and shopping list in hand, they took it and ran with it, and put their own spin on it as the design made its way from screen to real life. Here's how it's looking today! Looking much better than the before photos, right? We made a few simple changes that made a world of difference - new bedside tables, plug-in wall sconces, a rug, bedding, and roman shades. All of these items were really affordable as well! You can "shop the look" at the end of the post. Let's get to that open closet system, shall we? Photos first, then I'll talk about how we designed it! After comparing several options for open closet systems, we landed on the new ELVARLI system from IKEA. Specifically, we customized the post unit combination to create an incredibly functional closet that has tons of space for hanging and folded clothes, shoes and accessories. As you see in the photos, they've still got plenty of room to grow. I didn't edit down or remove anything for the shoot - this is 100% all their stuff displayed how they use it every day! The ELVARLI system is very sleek, customizable and extremely functional. I would definitely recommend it if you're in the market for something similar. When designing the closet system, I sketched out several diagrams of different arrangements for my clients to choose from, and they made the final decision based on their needs. Once that shopping list was finalized, they headed to IKEA to purchase everything, and installed it themselves (no small feat!). For those curious about cost, this arrangement came to just over $1,000 - not bad for huge custom closet. 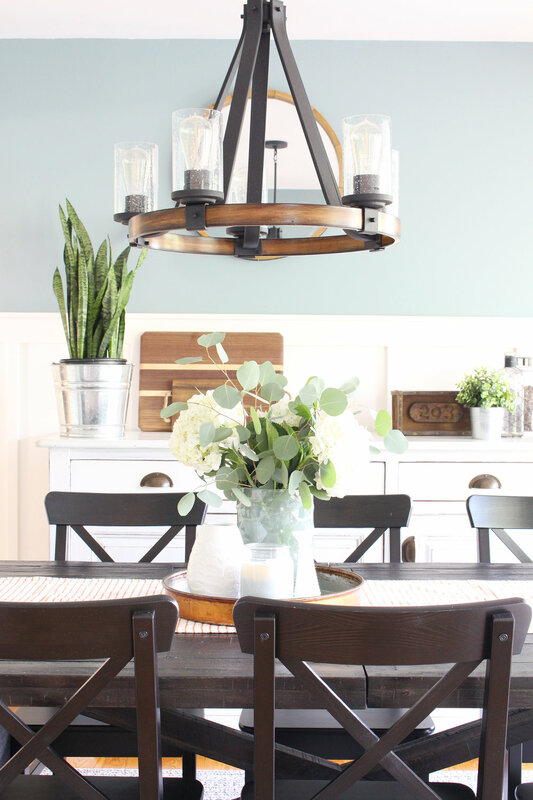 Overall, this makeover was very affordable - all in, the total was under $2,500. 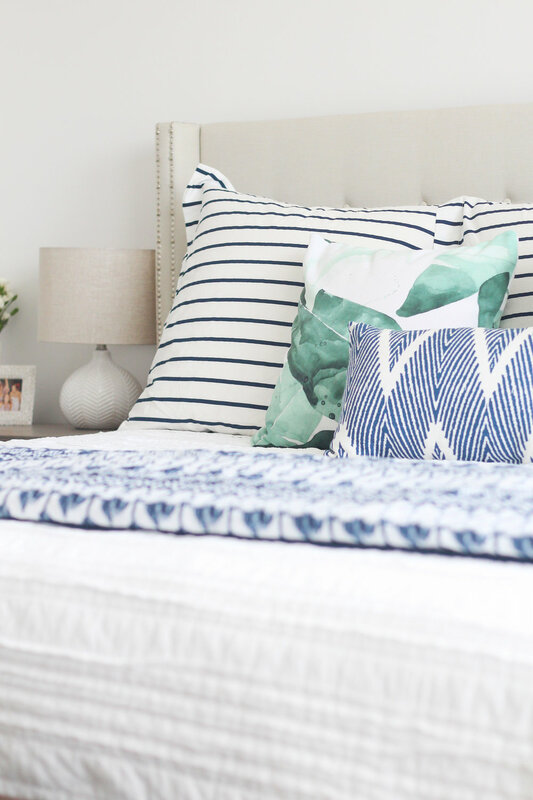 Each change we made had a big impact on ramping up the style and function of the room, and most importantly, my clients are thrilled with how their bedroom turned out! That, of course, makes me really happy as a designer. But don't just take my word for it. JT wrote a really kind and thoughtful review about the whole process, and he said I could share it with y'all here on the blog. I love hearing about how the e-design process went from the client's perspective, and I think you will too! Ease of Use: I filled out a questionnaire that asked questions about style and color preferences. I measured my room and made a simple floor plan. Then I took a picture of my room and emailed it to them. A few days later, they emailed me back with a few ideas. You do have to measure your own room, but overall pretty easy. Responsiveness: If I had a question, I got a response within 24 hours. Overall, very responsive. Design: I have a very large picture that's the centerpiece of my room. They had to find a design that worked with the picture and some of my existing furniture. I'm also very picky. Most ideas I liked. Some I wanted other options, which is to be expected and why I was happy with the responsiveness. Overall, they nailed it fairly quickly. Value: It cost $300. While not exactly loose change, I find myself really enjoying my room and hanging out there more often. The happiness I get from my new room is hard to value, but definitely more than $300. Overall, very affordable. Things to know: This is not a do-it-for-me service but a design-it-for-me service, so you need to be prepared to put in a little work, like measuring your room, shopping for the furniture, and assembling. There you have it! If you've been thinking about tackling a decorating project in your home, e-design may be a great fit. Hit me up on my contact page, or email me at chaney@mixandmatchdesign.com to get started! *Denotes that affiliate links were used in this post. When you purchase through one of these links, Mix & Match Design Company earns a small commission at no cost to you (i.e. no markup). Thanks for your support! Back in the spring, I hosted a giveaway for a full room e-design package, and today I get to share the before and after! The winners, Erin and Ryan, submitted their dining room, which Erin described as "pretty much a blank canvas" that had a $100 table from Craigslist, a dated light fixture and a hodgepodge of other pieces they were ready to let go of so they could make the space into something they really enjoy. They love hosting friends for meals and large gatherings, so they couldn't wait for the room to be done. Erin and Ryan are avid do-it-yourselfers, and have spent the past couple of years working on their house - transforming it room by room - to turn it into a place that feels more like them. 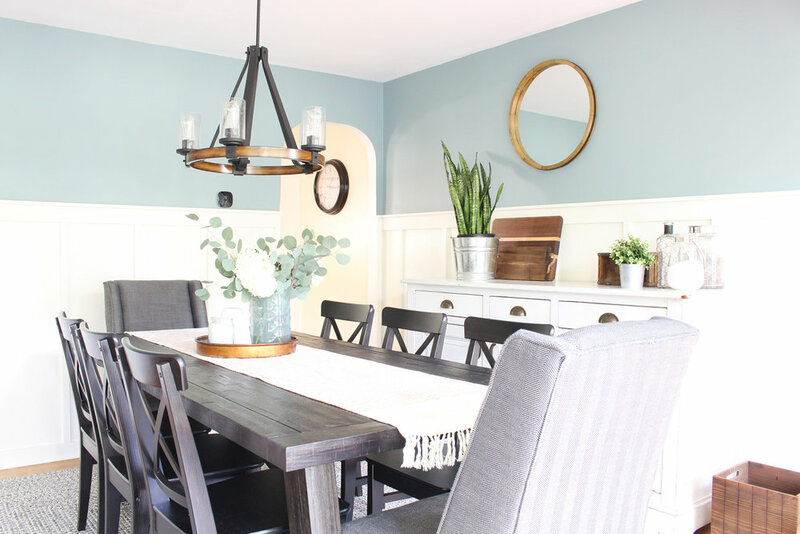 They love a mix of craftsman, industrial and farmhouse styles and their dining room did not reflect that - it was time for a change! As you can see, it's a fantastic room (big windows! arched openings!) that had loads of potential. It has a main dining area that opens up into the living room on one side and the kitchen on the other. Then, on the back side, there's a sort of separate area that the previous owners added on that leads to the back deck, but Erin and Ryan weren't sure exactly what to do with it. Their big needs were: a large dining room table for hosting their frequent, large gatherings, storage for serving pieces, and a way to make the addition feel like it was a part of the room. 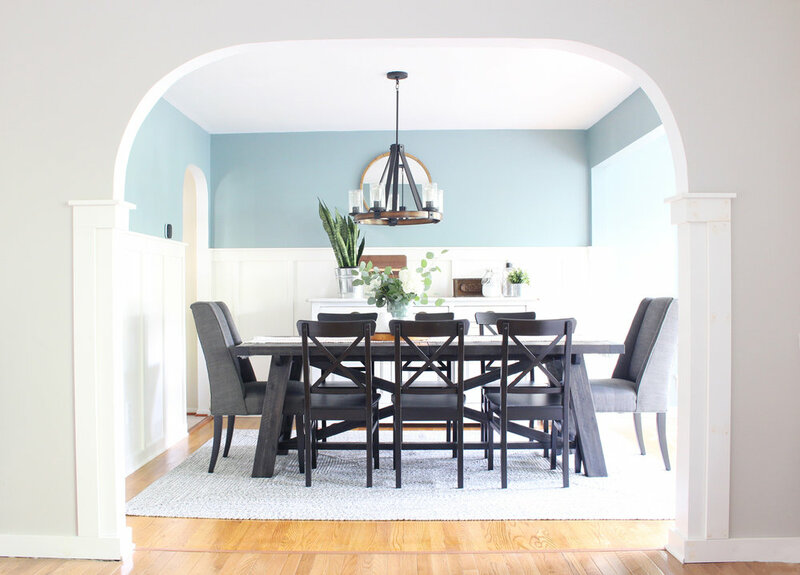 When I got involved, plans were already underway to clad the walls of the main dining area with board and batten and to replace the traditional trim with a simpler craftsman style. My job was to create a plan for the furniture and decor that would pull it all together - a challenge I was excited to take on! We decided to keep the furniture neutral and bring in color on the walls (the upper half is Benjamin Moore Sea Star), and in decor and accessories. Erin was actively involved in the search and putting the design together was a fun collaboration since she's got a great eye. 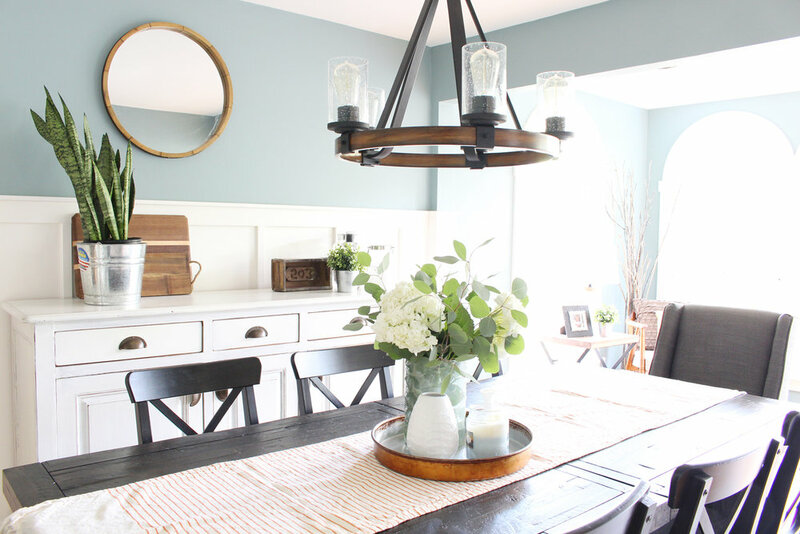 She also has a talent for hunting places like Craigslist and Homegoods for deals - she ended up finding a buffet that was almost an exact replica of the one in the design board for a total steal that way! I find that some clients want to know which exact items to purchase and don't even want to have to think about doing any extra searching, and some just need an overall vision to guide them and they'll take care of the rest - Erin is definitely the latter and she did a great job with the final purchases. So. Are y'all ready to see the "after?" Let's get to it! Designing the main part of the dining room was pretty straightforward. The tricky part was figuring out what to do with the addition since the walls are filled with windows that are a focal point in and of themselves. We knew it had to be something simple - we toyed around with the idea of placing an industrial iron and glass console against the windows with a lamp on top, but ultimately nixed that in favor of a chair, end table, and lamp combo for the corner. I think it ended up being the perfect choice! 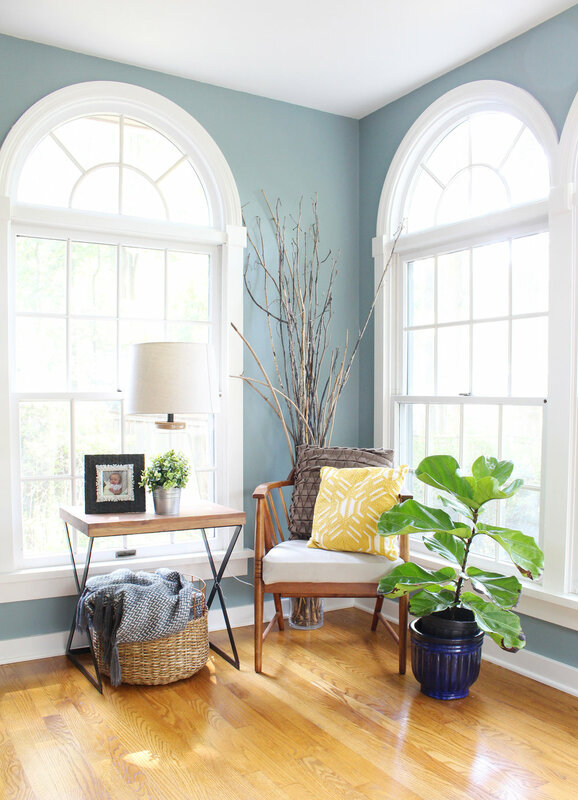 Plus, a happy plant or two never hurts - love that fiddle leaf fig! "When we assembled the room, Ryan and I just stood there and whispered how much we love it. Last night, we opened a bottle of red wine and just sat at the table and did a puzzle. In fact, we had a "grand opening" of the dining room and invited some friends over and served a seven course Italian feast. In addition, we had a small group dinner the other night and just shared life around the table... exactly my dream for the room!" Lastly, I have to give these two a shoutout for taking on this project with a newborn baby girl (who I had the privilege of meeting when I went to take the photos of their space), which was no easy feat I'm sure! Erin and Ryan, thank you for letting me help out with your dining room - I hope you enjoy it for many years to come! *Note: some of the links are affiliate links, which means that I may make a small commission off of your purchase (at no cost to you). Thanks for supporting Mix & Match Design Company in this way! It's reveal day! I'm so excited to share this modern farmhouse master bedroom with y'all. Since my e-design clients are all over the country, I don't often get to see the spaces once they're done and I certainly don't always get to take photos. These awesome clients, Courtney and Kit, are local, which means I got to see their finished bedroom in person(! ), and last weekend I headed out to the Philadelphia suburbs to snap some photos. 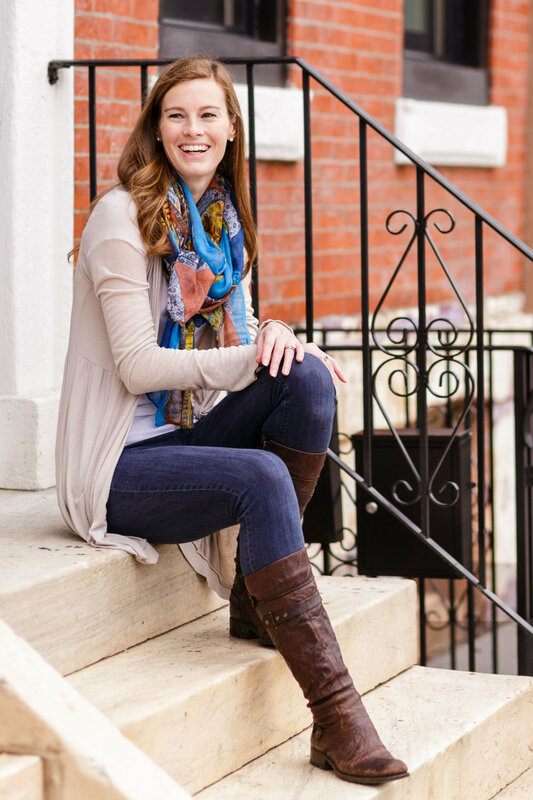 "After recently moving from a tiny Rittenhouse Square one bedroom to a brand new two bedroom apartment more than double the size in the Philadelphia suburbs, we knew we had lots of space to fill! Having had major life transitions include new degrees, new jobs, and a big move to a new town, our plates were pretty full. With so much going on, the thought of trying to fully furnish and decorate a second room (our master bedroom) seemed daunting. We had been following Chaney's blog for a while, which led us to Mix & Match Design Company. We went with the Full Room Design service, which had everything we needed. Chaney gave us a questionnaire to assess our must haves, likes and dislikes, style, and budget. We gave her some pictures of bedrooms that we found on Pinterest as a simple reference point and then she handled the rest. She quickly compiled a board of basic pieces - the bed, dresser, end tables, etc. - and gave us four different options for each major item that we were able to choose from. If there was something that we weren't sure about, she happily gave us alternatives to make sure that we were beyond pleased with our layout. She even added on some accent pieces to tie the room together beautifully. Chaney was always quick to respond and was a pleasure to work with. Once we agreed upon a final design, she sent us a list of all the items along with the links to purchase. How easy is that? We bought everything on the list and put our room together over a long weekend." Now onto the good stuff - the photos! There are so many things to love about this room - those botanical pillows, the sweet white lamps on the bedside tables, and that dark charcoal dresser are a few of my favorites. Also, I've got to give Courtney some serious credit for styling the whole room. She's got skills, y'all! She made my job so easy. I just showed up and snapped the photos. "My husband and I could not be more thrilled with the way it turned out and we can say nothing but great things about this experience! We will recommend Chaney to everyone we know!" Such kind words! :) They were wonderful to work with, and I'm glad they love their new master bedroom! If you need help with a room or two in your home, you can contact me here or send me an email at chaney@mixandmatchdesign.com. *Note: some or all of the shopping links are affiliate links, which means that I make a small commission from your purchase (at no cost to you). Thanks for supporting Mix & Match Design Company in this way!